Wi-Fi by far is the most popular wireless technology, carrying bulk of the data traffic originated from wireless devices. Current rate of deployments and statistics clearly suggest that more spectrum is needed to take up the load and offload saturated channels (2.4GHz and 5GHz). 540 MHz of 2.4 /5GHz spectrum carry more traffic than any other technology. As per the graph below (By Cisco), the dependency on Wi-Fi would only increase from here. 49% of traffic will originate from Wi-Fi in year 2020. How much spectrum is needed more? There has been discussions, studies and clear indications that , the world needs more spectrum for Unlicensed technologies. Quotient associates, conducted an survey and found out based on USA’s consumer and broadband access technology usage, we will need ~1600 MHz of spectrum to meet the demand in 2025. This clearly shows the current spectrum of 540MHz by no mean will be sustainable to meet even the minimum requirement of the future. Another important study, conducted by Qualcomm, confirms these results using a different methodology. 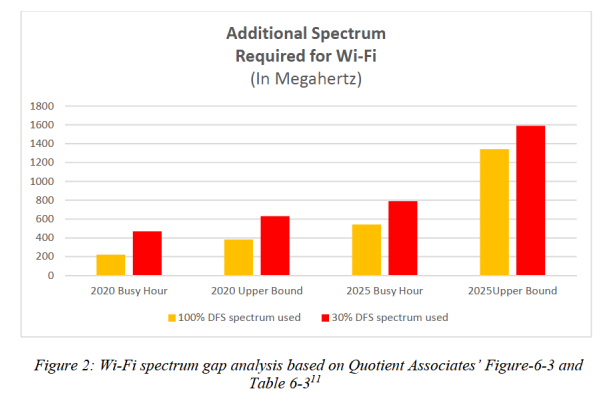 Qualcomm’s Quantification of 5 GHz Unlicensed Band Spectrum needs,concludes that to enable future WLAN-type application and usage scenarios, regulators should plan for around 1280 MHz of unlicensed spectrum centered around the 5 GHz band for use by unlicensed technologies. The 2.4 GHz band is already saturated in many locations. With demand continuing to increase, meaning that today’s workhorse bands for unlicensed usage are located in 5 GHz spectrum. 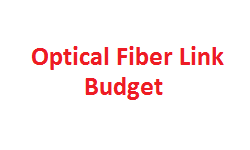 Although these bands have played a crucial role in meeting consumers’ ever-growing appetite for broadband capacity, many portions of the broader 5 GHz band are subject to restrictions that limit their use. Furthermore, the 5 GHz band provides insufficient spectrum for wider bandwidth channels (e.g., 80 or 160 MHz) to meet demand in dense environments today and to meet growing consumer demand in the future, thus undermining the provision of gigabit services at the very moment when our entire economy is digitizing. Finally, while the Commission’s decision to open new spectrum to unlicensed technologies in the 64-71 GHz range is a forward-looking and important step, these millimeter band frequencies have limited propagation and penetration characteristics that make them inadequate as a substitute for mid-band frequencies. 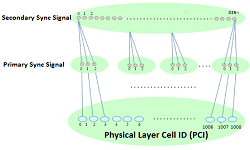 These are primarily used as Backhaul connectivity for P2P / P2M use cases. Hence, it is very critical and important to understand that unlicensed spectrum needs to be expanded to 6GHz band. 5G will be the real HetNet, which will have combination of both licensed and unlicensed technology. 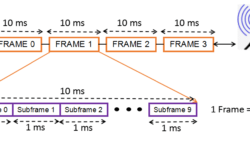 The Gigabit throughput, very low latency and real time use cases requires a lot of spectrum to deliver QOS.Cellular network would need support of unlicensed technology and spectrum. Unlicensed spectrum lowers barriers to entry, expands consumer connectivity, and allows more enterprises to take advantage of new business processes, thereby driving innovation and investment across the economy. Doing so sooner rather than later will compound the benefits of innovation by providing industry stakeholders regulatory certainty before completion of the next generation of wireless standards. As the next generation of Wi-Fi, called IEEE 802.11ax, is currently under development, and could seamlessly support 6 GHz operations. This is the right time to make 6GHz / Additional spectrum available, so that manufacturers of the equipment can support the same. The manufacturers can move to take advantage of new 6 GHz channels, which will deliver orders of magnitude more capacity and efficiency than prior generations of Wi-Fi. The technology manufacturers signing the filing (link) are committed to delivering 6 GHz capable products and services to the market in a timely manner given regulatory rules that support investment. All the big companies (name mentioned below in the references section) are strongly supporting mid band spectrum for the unlicensed technologies. The timing of this proceeding could not be better. In anticipation of regulatory action by the US and other nations, the IEEE 802.11ax Task Group recently voted to extend coverage to the 6 GHz band. 6GHz for Unlicensed at this time ( with 802.11ax ) can be win-win situation for vendors, consumers and regulators. Recently around 30 entities signed the filling, which recommends use of 6GHz mid band for unlicensed technologies for meeting the rapid growth of the dependency on the unlicensed technology/ Wi-Fi. The companies were from all entities of the network equipment, internet media, software, cloud, semiconductor, enterprise, service provider and rural connectivity industries. Their proposal is in response to the FCC’s call for comments on expanding flexible use in mid-band spectrum between 3.7 and 24 GHz. Specifically, they’re proposing that the FCC consider establishing multiple 6 GHz sub-bands, ensuring that technical rules and interference protections for each segment of the band are appropriate to incumbents operating in the frequencies. 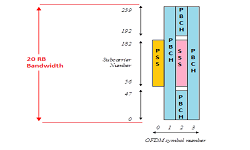 Taken together, the four sub-bands can be referred to as one 6 GHz band. Points Broadband Amplex Electric, Inc., dba Amplex Internet Apple Inc. Blaze Broadband Broadcom Limited Cambium Networks, LTD Cisco Systems, Inc. Computer Office Solutions Inc., dba Snappy Internet Cypress Semiconductor Corporation Dell Inc. Electronic Corporate Pages, Inc., dba Western Broadband Extreme Networks, Inc. Facebook, Inc. Google Hewlett-Packard Enterprise HP Inc. Intel Corporation Interwest Management Services Inc., dba Fire2Wire JAB Wireless, Inc., dba Rise Broadband 23 Joink, LLC MediaTek Inc. MetaLINK Technologies, Inc. Microsoft Corporation New Wave Net Corp. Pixius Communications, LLC QUALCOMM Incorporated Ruckus, a business unit of Brocade Communications Systems, Inc. Sony Electronics, Inc. Wireless Internet Service Provider Association Wisper ISP, Inc.